by Creswell, John W.; Guetterman, Timothy C.
If purchasing or renting from companies other than Pearson, the access codes for the MyLab platform may not be included, may be incorrect, or may be previously redeemed. Check with the seller before completing your purchase. This package includes MyLab Education. 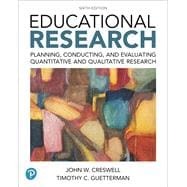 Educational Research: Planning, Conducting, and Evaluating Quantitative and Qualitative Research offers a truly balanced, inclusive, and integrated overview of the processes involved in educational research. This text first examines the general steps in the research process and then details the procedures for conducting specific types of quantitative, qualitative, and mixed methods studies. Direct guidance on reading research is offered throughout the text, and features provide opportunities for practice. Throughout the 6th Edition, examples are now drawn from a broad range of fields, including program evaluation, multicultural research, counseling, school psychology, and learning and cognition. In addition, enhanced coverage incorporates the latest technology-based strategies and online tools, and more information about single-subject research methods. MyLab is the teaching and learning platform that empowers you to reach every student. By combining trusted author content with digital tools and a flexible platform, MyLab personalizes the learning experience and improves results for each student. MyLab Education helps learners understand the basic vocabulary of educational research, acquire hands-on experience, and get guided practice in understanding research articles and in conducting and reporting their own research. John W. Creswell, PhD, is a Professor of Family Medicine and Co-Director, Michigan Mixed Methods Research and Scholarship Program at the University of Michigan. He has authored numerous articles and 27 books on mixed methods research, qualitative research and research design. While at the University of Nebraska-Lincoln, he held the Clifton Endowed Professor Chair, served as director of a mixed methods research office, founded the SAGE journal, the Journal of Mixed Methods Research, and was an Adjunct Professor of Family Medicine at the University of Michigan and a consultant to the Veterans Administration health services research center. He was a Senior Fulbright Scholar to South Africa in 2008 and to Thailand in 2012. In 2011 he co-led a national working group on mixed methods practices at the National Institute of Health, served as a Visiting Professor at Harvard’s School of Public Health, and received an honorary doctorate from the University of Pretoria, South Africa. In 2014 he was the President of the Mixed Methods International Research Association. In 2015 he joined the staff of Family Medicine at the University of Michigan. Timothy C. Guetterman, PhD, is an applied research methodologist and Assistant Professor at the University of Michigan. His research interests, scholarship, and teaching are in research methodology, namely mixed methods research. He has authored numerous articles and chapters, including empirical studies and methodological articles to advance rigorous methods of quantitative, qualitative, and mixed methods research. In addition, he is an investigator on three U.S. National Institutes of Health (NIH) funded research studies. Tim’s empirical work uses mixed methods research to investigate the use of technology in health professions education and in educational assessment. He also conducts research on teaching, learning, and developing research methods capacity in his role as evaluator and faculty for the NIH-funded Mixed Methods Research Training Program for the Health Sciences. He has extensive professional experience conducting program evaluation with a focus on educational and healthcare programs.